I was a little surprised to hear that Arslan: The Warriors of Legend was being turned into a Musou game and, even more surprising, being brought to the U.S. It turns out the folks at Koei Tecmo knew what they were doing, however, as the world of Arslan turns out to be a perfect for all of that hack and slash action and the game itself is a perfect introduction to The Crown Prince of Pars and his ragtag band of companions. It's not uncommon for Koei Tecmo to take the Dynasty Warriors DNA and inject it into other popular franchises. In the past, they've done this with series like Gundam, Zelda and, most recently, Dragon Quest and One Piece. The difference between those series and Arslan: The Warriors of Legend, however, is that most U.S. gamers are unfamiliar with this latest series to be getting the Warriors treatment. Arslan began as a series of Japanese books back in the 1980's and has since been turned into various incarnations of manga and anime. The most recent anime series hit the airwaves in 2015 and seemed to do pretty well here in the States. Maybe that small amount of momentum is what led the team at Koei Tecmo to localize the Arslan game, which took me a bit by surprise. I'm not sure why Arslan: The Warriors of Legend caught me off guard as a potential Musou game. It features a sweeping story full of twists and turns, bright and colorful characters versed in a wide array of weapons, as well as a long-running struggle over a kingdom in turmoil that takes the form of one epic battle after another. While it may not be the Romance of the Three Kingdoms in terms of scope, it's actually a perfect fit for the Warriors flavor of gameplay. In case you now feel like you have to run off and buy a bunch of manga or watch that most recent anime, you can actually just pick up this game in order to get totally caught up. 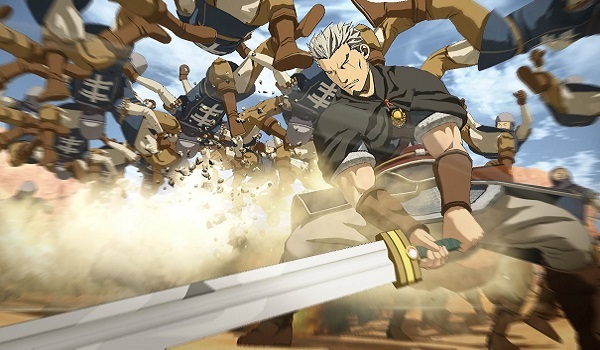 The Arslan game uses the newest anime as a backbone for its story and character designs, and the narrative even takes the player through the entire 25-episode run of the show. When it comes to video games, that usually means you're going to get a couple of short cutscenes here and there with bits of dialogue popping up to fill in the blanks. When it comes to most games built off of existing properties, the developers make the assumption that you're already familiar with the source material. That's not the case here, as Arslan is possibly the most narrative-focused Musou game to date. We'll get to the fighting in a moment, but those big battles are bookended by a lengthy cutscenes that take the time to build the world, introduce the characters and give them room to grow. You'll find yourself watching five and ten-minute scenes pretty regularly, which is a welcome change of pace since, again, many folks aren't familiar with this story. I'm a little bummed that the cutscenes are basically lightly animated slideshows, but they certainly get the job done. Along the way, you'll be introduced to a fun cast of characters that's diverse on and off the battlefield. You begin the game as Arslan, the young and naïve prince of the kingdom of Pars. The kid has a heart of gold, though, and genuinely wants to be a strong leader someday. For that reason, a motley crew of war vets and advisers flock to Arslan's aid when his home is taken over by the kingdom of Lusitania, offering their support as Arslan tries to rebuild an army and take back his homeland. Thankfully, all of these folks are well-versed in the art of war, bringing their expertise to the battlefield in some unexpected ways. While most of the characters fall back on swords, spears, bows and the like, some of your companions offer a completely unique set of abilities. One of the first allies to join your team, for instance, is the brilliant tactician Narsus. The guy is also an avid painter, even though the quality of his work is always in question. What he may lack on the canvas he makes up for on the battlefield, however, as his brushes and paints make for an interesting twist on standard weaponry. And speaking of combat, outside of a couple of new twists, any fan of Dynasty Warriors and other games of its ilk will feel right at home here. You'll still be running around large arenas, moving from objective to objective while obliterating literally thousands of mostly brain-dead enemies foolish enough to stand in your path of destruction. Each character has their basic, strong and charged attacks, as well as their powerful Musou attacks they can unleash after dishing out enough damage. Most characters can switch between a couple of weapon types as well, with a hot-swap ability letting you continue a powerful combo with your back-up weapon. As your characters grow in strength, they'll earn longer combos as well as the ability to add elemental effects like fire or poison. You can also equip them with dozens upon dozens of skill cards you'll find on the field of battle, which will give them boosts in various stats and abilities. You'll also discover recipe books on the battlefield, giving you the chance to prepare a meal before a mission that will give you additional bonuses. There are a couple of areas where Arslan sets itself apart from more recent Warriors games, though. For starters, fighting on horseback is a pretty viable option from time to time, and there's a whole new system called Marsdan Rush that lets you take control of an entire unit at once. In other words, if you trigger a Marsdan Rush in a certain area while on horseback, the camera will pan back as you and your entire army start to move as a single unit, taking out everyone who stands in your way. Trigger a Rush with your archer unit and you'll paint the sky black with arrows. Need to get through a barricade? Trigger a rush, build up some momentum and plow through the obstacle. While all of that's well and good, I was a little disappointed in the combat mechanics that pop up when taking on a more powerful opponent. 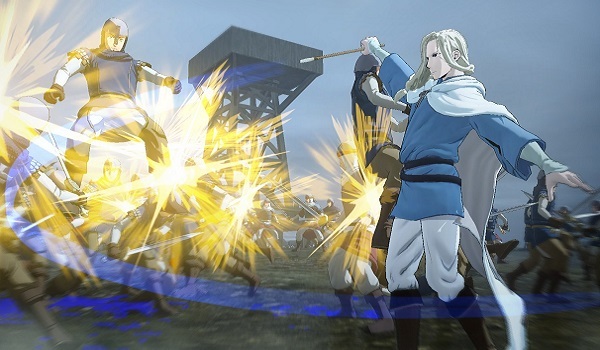 Rather than rely on clever parrying or the sort rock-paper-scissors version of attack versus defense seen in other games, Arslan relies on a simple overshield of sorts. In other words, you won't be able to harm the big bad until their shield breaks, which is achieved by simply wailing on them for a while. As a result, most of the game's strategy goes out the window as you find yourself simply linking combos to break the shield and then hitting your Musou attacks while their guard is down. Outside of the campaign, you'll be able to fill your time with score attacks, multiplayer battles and the ability to dive back into unlocked scenarios in order to collect more loot or discover new secrets once you've added certain characters to your team. It's not as robust a package as the core Warriors games, but it's plenty to fill out an entertaining Musou game that puts about as much focus on the story as the combat. In my book, that's a nice breath of fresh air, making Arslan: The Warriors of Legend a perfect fit for Warriors fanatics as well as newcomers to the Arslan tale or this entire genre of games. This review based on a PS4 copy of the game provided by the publisher.